300 handpicked rebel militants trained by the US, Israel and Jordan entered Syria and began advancing towards Damascus in the days before an alleged chemical weapons attack, the French newspaper Le Figaro is reporting. “The rebels were trained for several months in a training camp on the Jordanian-Syrian border by CIA operatives, as well as Jordanian and Israeli commandos,” reports the Jerusalem Post. Four days before the announcement that a chemical weapons attack had taken place near Damascus, a group of FSA fighters crossed into the Deraa region, followed by a second contingent on August 19th. The CIA began conducting covert training of the rebels – despite their links to Al-Qaeda – late last year, advising them on how to use anti-tank and anti-aircraft weapons. In the absence of any independent evidence that Assad’s forces were behind this week’s alleged chemical weapons attack, several countries have seized upon the story to threaten military action, with numerous lawmakers in Congress who had initially opposed arming the rebels now “beginning to reconsider intervention,” according to Foreign Policy. Whether the alleged chemical weapons attack was an attempt by the Assad regime to target the militants, or as Russia asserts it was a conveniently timed “planned provocation” carried out by the rebels themselves to coincide with the movement of CIA-trained FSA militants, remains to be seen. Numerous impartial analysts have commented on how it makes little sense for Assad’s forces to have carried out such an attack days after UN chemical weapons inspectors entered the country. In addition, other experts have cast doubt on the assertion that chemical weapons were used at all. Paula Vanninen of the Finnish Institute for Verification of the Chemical Weapons Convention questions the behavior of those seen handling the victims in the video footage. “At the moment, I am not totally convinced because the people that are helping them are without any protective clothing and without any respirators….In a real case, they would also be contaminated and would also be having symptoms,” he stated. 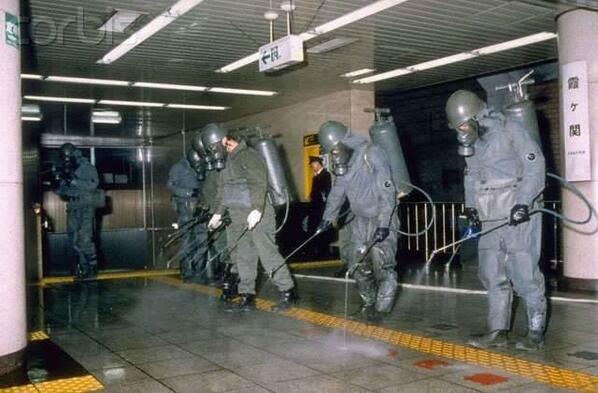 Although some experts are claiming that the nerve agent used was most likely sarin, compare photos of the protective gear worn by Japanese chemical weapons specialists who cleaned a metro station in Tokyo eight hours after a small bottle of sarin was thrown in 1995, to thecomplete lack of protective gear worn by those seen handling victims in the video footage released earlier this week. Stephen Johnson, an expert in weapons and chemical explosives at Cranfield Forensic Institute, told Euro News that the video footage also looked suspect. “There are, within some of the videos, examples which seem a little hyper-real, and almost as if they’ve been set up. Which is not to say that they are fake but it does cause some concern. Some of the people with foaming, the foam seems to be too white, too pure, and not consistent with the sort of internal injury you might expect to see, which you’d expect to be bloodier or yellower,” Johnson said. His comments were echoed by chemical and biological weapons researcher Jean Pascal Zanders, who said that the footage appears to show victims of asphyxiation, which is not consistent with the use of mustard gas or the nerve agents VX or sarin. “I’m deliberately not using the term chemical weapons here,” he said, adding that the use of “industrial toxicants” was a more likely explanation.